Purchasing your own dive equipment can be a costly endeavor, especially if you dive only occasionally. Additionally, it can be overwhelming if you aren’t sure what dive equipment you might like or what might work for the type of diving you will primarily be doing. This is why the equipment rentals are also attractive to those that are looking to purchase something new and gives them a real test drive. 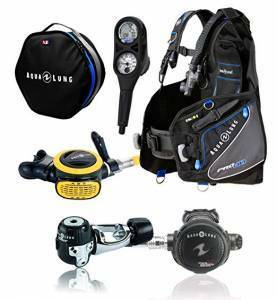 Dive equipment is a vital part of scuba diving and therefore personal preference plays a large part of what equipment will be right for you. You also may need to rent equipment if you discover at the last minute before a dive trip that a piece of your gear is malfunctioning. This is why keeping up with regularly scheduled maintenance is important to avoid any gear surprises! The Scuba Company provides rentals to students as well as anyone who is certified looking to head out on a dive trip. Whether you are traveling out of state/ country or just heading to Blue Hole for the weekend, we have all the equipment you may need available for you to rent. You have the option to rent the equipment as a full package or piece-by-piece to supplement your personal equipment. Additionally, many of our more major classes include the gear rental in the price of the course and therefore you won’t have to worry about what you need, it will be provided for you! 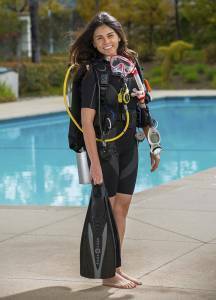 For a breakdown of scuba gear, check out our page on dive equipment. The cost for the full rental package is $70 for the first day and $35 for each subsequent day. For a weekly rental, it is $240. The Scuba Company asks that all rental equipment be returned clean and dry in the same condition as you received it. This includes the weights safely secured on the weight belt and away from the rest of the rented equipment. Please clean and dry all rental gear prior to return to avoid any cleaning fees. If you aren’t sure the best way to clean a specific piece of gear, ask a member of The Scuba Company team or check out this handy guide here.